Stand out in a crowded mailbox with custom postcards. They are the most effective, yet affordable direct mail strategy for Accountants and Tax Preparers. 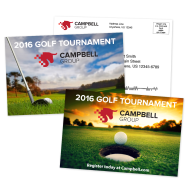 From standard postcards to oversized postcards, your firm's marketing campaign is in good hands. Also, take advantage of our Direct Mail Services. With our printing, addressing, labeling and postage options, we have you covered. Just send us your list or ask us about our (EDDM®) Every Door Direct Mail service. Custom printed postcards are a proven marketing asset for Accountants and Tax Preparers. Whether you are crafting a business-to-business marketing campaign, or a business-to-consumer direct mail campaign, a custom postcard will stand out and give your brand an extra promotional push. In fact, postcard marketing has even emerged as one of the single best ways to drive customers and prospects to your website and social media. 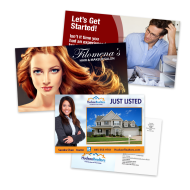 They're a popular promotional choice because they are simple to create and inexpensive to print, and unlike other forms of direct-mail marketing, postcards almost always get read. Sending out mailings can take way too much time and effort. Let us do the work for you! With our printing, addressing, labeling and postage options, we have you covered. Just send us your list, or ask us about our (EDDM®) Every Door Direct Mail service, and we'll make sure that your marketing materials are delivered effectively – it's that easy! For further details, give our customer service team a call at 800-447-6788.